Native Instruments have released Kontakt 2.2, an update for its flagship sampler. They tell us that the new version brings a wide range of functional enhancements and optimizations, ranging from improved loop handling and group management to extended KSP and Universal Import functionality, as well as compatibility with Intel-based Macintosh computers. Handling of sliced loops in Kontakt 2.2 is now more flexible and convenient due to new drag-and-drop and in-sync preview functionality. Group management has also been improved with a load/save function, 128-voice groups and new group presets. NI sat that the KSP engine now offers additional functions that allow for an even wider range of creative scripting usage, while new modulation, tuning and envelope features expand the sound shaping capabilities of Kontakt 2. The powerful Universal Import function in version 2.2 now supports five additional formats, which, say NI, underscores the role of Kontakt 2 as the most compatible sampler on the market. 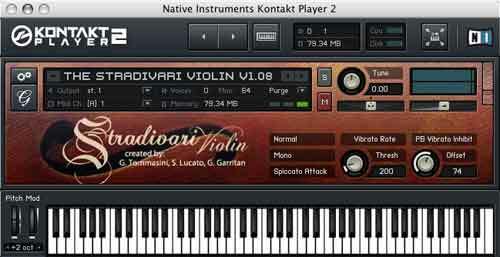 A new Kontakt 2 demo based on version 2.2 will also available for download shortly.